Play the harp without having to buy an expensive instrument. This gives you an opportunity to learn to play music while costing you a lot less! Harps can be hired for short or long term. Based in Pt Chevalier, Auckland and can deliver throughout NZ. Have a go at playing the harp today! There are 22 string, 23 string, 26 string, 27 string, 29 string and 34 string harps for hire. The larger instruments will fit in a station wagon, or in some cases across the back seat of your car. The 22 - 29 string ones are smaller and easy to transport..
22 - 26 string harps can be delivered around the country, via courier, inside a harp roadcase. If you are wanting a larger one you may want to consider a trip to Auckland to pick it up. Most of the harps are fully levered and some have levers on C, F and B strings. Others have no levers and are tuned to the key of C.
This is like having all the white keys on the piano. The Teach Yourself book that will come with your harp is perfect for harps with or without levers as all the music is written in the key of C.
Harps are to be picked up from Pt Chevalier, Auckland - although in special circumstances, and for out of town hirers, delivery is available. There will be an extra charge for delivery if this option is taken. If you wish to take lessons you can leave your harp at home, Robyn has an extra harp in the studio that you can play so there is no need for you to bring your one. This means you can fit your lessons in without having to go home after work or school to get your harp. If you live a busy life, or maybe don't want to spend more money on lessons, or the petrol to get to them, you can work through the teach yourself book at home at your own pace. This book will guide you through the process of learning to play the harp with photographs and exercises to help establish basic playing technique. The teach yourself book has 48 songs and instrumentals for you to play. 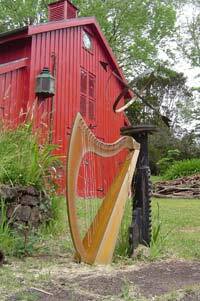 Harps are available for hire anywhere in New Zealand. If you live in a remote rural part of NZ you can now learn the harp at home. Harps can be transported throughout NZ via Fastway Couriers. If you have a harp teacher living nearby you can hire an instrument and attend lessons. Have a look in the New Zealand harp teachers directory and see if there is a teacher close you. Are you a harp teacher looking for a harp for a student? If you teach harp, either at a school or at home, and have potential students who have no instrument please contact Robyn regarding hire as she is happy to supply harps to other teachers anywhere in New Zealand. No longer are you only able to learn the harp if you have a teacher nearby. With today's technology you can have lessons using the internet and a free program called Skype. There are many people all over the world who are embracing this idea and you have many harp teachers to choose from if you want to learn in the online environment. If all the rental harps are out your name can go on the waiting list. You will be contacted as soon as an instrument comes in to arrange a time to pick up. It is not usually a long wait. You can hire a harp for friends or family for Christmas, or a birthday surprise. Some people choose to also gift lessons with this option. Definitely a very special present! Below is a 26 string rental harp. 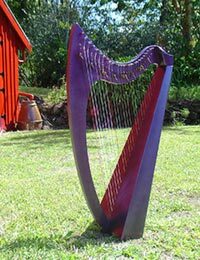 Harps are available in a variety of different colours and also in beautiful stained, or natural wood. Hire harps are subject to availablity - please contact Robyn to discuss what harp would best suit you. and any enquiries are very welcome! Some people have a go and find they are too busy for learning a musical instrument, others find they love playing the harp and then decide to buy their own, others get very enthusiastic and build their own! Who knows where having a go at playing the harp may lead you!! Hiring a harp is the most inexpensive way to try it out! My 10 year old son Ollie was keen to start learning the harp but my husband and I were suspicious...was this a genuine interest or just a fad? Rather than investing in a harp we decided to hire one from Robyn. This was definitely the right decision. Robyn supplied us with a lovely harp that was excellent quality and the perfect size for a 10 year old to play and carry to and from his lessons. Ollie fell in love with his new instrument, played it every day and after two years of dedication we decided to purchase him his own harp. I can highly recommend Robyn's harp hire service. It allowed our son to explore his passion without my husband and Ii having to commit a big front investment - and Robyn is professional, accommodating and very easy to deal with. My I'm an Asian girl in New Zealand. When I was in my own country I was very interested in playing harp. But at that time, I had no chance to find a harp and a teacher. After I came to New Zealand, I was searching in the internet and finally I found Robyn. It's really easy to hire a harp and the fee is adorable. And Robyn is a really nice teacher, she is patient and kind. Save me from being awkward lol. Btw her cat is also very very cute and friendly. Hiring a harp from Robyn was an absolute pleasure. The instrument itself was easy to play and sounded great, and the book and equipment with it really made it nice and straight-forward to learn. I highly recommend Robyn to anyone curious about harps! It was a Thank you for the service you provide, really worthy for the beginner. My daughter is interested in learning the harp but it is not the right time for her, as she needs to focus on preparing her paino grade exam now. After the last 3 months trial, she knows that she loves it and wil buy one when she is ready to continue the harp lesson study in the future.Really appreciated your help. Thanks for letting me know it got back ok and thanks for great service. It was a lovely experience hiring a harp from Robyn. Having been away from the harp for so long, Robyn made the whole process smooth and easy. Robyn made sure that guidance was provided each step of the way which I greatly appreciated. Will definitely recommend Robyn as the go-to person for anyone looking to step into the beautiful world of harps. I started playing the harp when I was in school but once reaching university, I didn't have time to keep practicing. Five years later I thought it would be great to get back into it, but finding a harp in NZ was much harder than in France where I used to live. Robyn was the only person I found renting "big" harps so I got in contact with her. Everything from there was so easy. I had the harp within a couple of weeks and kept it for almost 3 years. Due to a few changes in circumstances I wasn't able to play as much anymore and thought it was unfair of me to keep the harp when someone else might be looking to hire it. I still thoroughly enjoyed every moment I got to play and definitely hope to find the time to properly get back into it in the future. I fully recommend for anyone who wants to start or get back into playing the harp to contact Robyn as hiring a harp is the best way to go before putting in the investment to get your own. The harp is also a beautiful and enchanting instrument that I wish more people played! Hiring the harp from Robyn over several months has meant my daughter has had the opportunity to begin learning this beautiful instrument. Dealing with Robyn has been very straight forward and easy. My daughter has fallen in love with playing the harp and we have now been able to buy her one of her own.Thanks so much for the opportunity to hire one Robyn and help her begin this musical journey. The whole process of renting the harp was quick and easy. With the harp I got a step by step guide to teach me how to play from the very beginning which was really useful and I had a tuner to make sure my harp was at the perfect tone to play on. The service was really good. I recommend Robyn Sutherland when it comes to harps. Having access to a harp for our daughter to learn on was an absolute dream. She was able to learn a new instrument without the full outlay on a new instrument without knowing how long she might hold an interest in it for. Robyn is an absolute pleasure to deal with, I will miss the sound of the harp in the house and sincerely hope our daughter decides to take it up again in the future. Hoping we will be back! Thank you so much for the creating the opportunity for people to hire a harp. It was excellent to have the experience of playing this wonderful instrument without having to outlay thousands of dollars. Robyn is friendly and helpful to deal with too. You will have a great experience hiring a harp from Robyn! It has been a great experience hiring a harp from Robyn. I have always wanted to play a harp, but thought it was too difficult to get one. However, Robyn was able to hire a harp to me so I can start playing. It has a lovely sound and is a really good quality instrument. I really enjoyed it. If you are wanting to try a harp, hire one from Robyn and give it a go. As a teacher, Robyn is able to show clearly what is the best way to play the harp. It was fantastic. I enjoyed it and thank you for the opportunity to do so. It's something I have wanted to do for a long time. Thank you from the bottom of my heart for a childhood dream come true. I have just enjoyed 6 months of experiencing the beauty that is the harp, as did my children, who were inspired to give it a go as well, thanks to the convenience of having one in our home. Robyn, thank you for trusting us with your instrument. You've been an absolute joy to deal with and couldn't have made this any better than what it was. Despite not being in the same city, The six months I've enjoyed the harp have been a dream and a breeze and I would highly recommend, if not urge, anyone who is considering or wishing to try the most beautiful instrument on earth. Thank you so much for providing a harp rental service and giving me the opportunity to discover what a joy and delight playing the harp is. Even as a beginner it sounded wonderful and has given me many hours of pleasure. I have a small lap harp and wanted to see if I preferred a larger harp instead so I hired a 29 string harp from Robyn for three months. She supplied a great learner's book which was easy to follow and had varied and interesting tunes in it, as well as tuner and tuning fork. The cost was very reasonable. Robyn was easy to deal with and I am very pleased I used her service. I highly recommend Robyn if you are looking at hiring a harp. Absolutely Robyn has offered the most incredible support to me since I decided I would like to be able to play some harp music to my dad on his deathbed. I have had the privilege of hiring first a 22 string harp and then moved to a 29 string at Robyn's suggestion. Both harps were in great condition with a beautiful sound. Being a complete beginner, Robyn helped me find a way to tune the harps, offered support and encouragement along the way and when I went to pick up my second harp was keen to show me some basic harping skills. I wholeheartedly recommend Robyn and the harps she obviously cherishes, she definitely makes starting to play easy. Absolutely loved hiring a harp from Robyn. After learning the harp as a child it was wonderful to have the opportunity to start playing again. I found the complementary instruction book very helpful and Robyn also directed me to some fantastic websites with contemporary sheet music. Highly recommend playing the harp and hiring hrough Robyn. Hiring a harp and taking lessons with Robyn has been completely wonderful. Such a fabulous introduction to playing an instrument for a complete (and late in life) beginner. I felt a little insecure abut this new venture of learning to play at first, but Robyn soon made me feel like (even I) could learn and enjoy the beautiful instrument. Would definitely recommend the experience! Hiring a harp from Robyn has been a wonderful experience for our 9 year old daughter. She has wanted to learn for a few years, being able to hire an instrument has given us as parents the opportunity to see if our daughter was committed to learning the harp before purchasing one. Robyn has always been very easy to contact and accommodating. Her hire harp was in lovely condition. Thank you. Have had such good practise on that harp. The harp is sturdy and suitable for all levels that harpists are practising at. It can be tuned well with the given tuner. At aged 60 I thought that I had "missed theta" as far as making music was concerned, however with Robyn's amazing skill and patience, I was able to amaze my family, even if they are easily pleased and very kind - or maybe it was because they were fed up with the Saxophone. Whatever it was - I thoroughly enjoyed the experience and would not hesitate in recommending Robyn and her amazing harps. I thoroughly enjoyed learning the harp and found that Robyn was very accommodating and was willing to help if needed. The learning book is very helpful and goes through learning the harp step by step. I would highly recommend Robyn to anyone wanting to learn the harp. A great experience! Being able to hire a harp for six months from Robyn allowed me to try out my dream of playing this most beautiful of instruments before purchasing my own harp. Robyn made the whole process of getting the harp to me a breeze. I really appreciated Robyn's excellent communication and obvious care and enthusiasm in sharing her lovely instruments. I shall miss the little 26 string harp. It has been a blessing not just to me but to others as well. An example of this was, while taking a music therapy session with one of my aggressive autistic clients, she calmed right down and actually fell asleep while listening to the harp's calming and healing sounds. I was absolutely amazed! A heartfelt thanks to you Robyn. May many others get to discover the pleasure of playing the harps you offer. There is something very special about having beautiful musical instruments in the home for the whole family to play and experiment with, for growing children to find comfort and happiness in the sound, and to encourage singing together. You can fill a space with peace when there is a harp to play! It was an absolute pleasure hiring a harp from Robyn. She was lovely to deal with at all times and the harp was absolutely beautiful and sounded just as one imagines this magical instrument will sound. Even without any skill or knowledge it was possible to create lovely music! It was much easier to learn and play than I expected (I was a complete novice) however like any musical instrument it does take time and practice to master more complex music, particularly the skill of playing with two hands simultaneously. I would highly recommend hiring a harp from Robyn and experiencing the joy of this beautiful instrument. Thank you sincerely for allowing me to hire and play the harp. It is a truly beautiful and mystical instrument and playing it brought me so much inner joy and peace. I know in the future the harp will once again be a part of my life. I still listen to harp music playing as part of meditations now and again. I really enjoyed hiring the harp from Robyn! As someone with no musical background, the harp proved quite easy and fun to learn since is sounded so magical even when just plucking random strings. Would definitely hire again from Robyn. She is really accommodating and helpful. I highly recommend Robyn's services! I hired one of Robyn's 26-string levered harp and although I live in Wellington, the harp came to me easily through another harp hirer in Welly. The monthly price for hiring is very reasonable and I managed to save a considerable amount on shipping costs because I passed it onto another person in Wellington at the end of my hiring period. Robyn is very flexible in her services and thus helped make this a wonderful experience for me. I had a great time learning the harp on the rental, and it was a great harp for a beginner like me to try out. It sounded great and was loads of fun to play. I really enjoyed the experience of learning the harp, I only returned it because life was getting a little hectic and it wasn't getting the attention that the beautiful instrument deserved. The whole experience of hiring the harp was an easy straight forward and enjoyable experience. Robyn is a pleasure to deal with. I really enjoyed learning to play the harp and found the time I spent practising very relaxing and easier than I was expecting, it has also encouraged me to get back into reading music which along with the playing I find very beneficial in regard to exercising my mind. So many thanks for giving myself and others the opportunity to experience the pleasure of this old and magical instrument. Learning to play the harp has been an awesome experience for me. I recommend this incredible instrument to anybody young or old. The beautiful sound that comes out of this 26 stringed instrument is so amazing. Thank you Robyn for giving me this opportunity Mauri ora, Lilz. I just would like to say thank you very much for the opportunity to hire a harp. I heard a lady playing the harp at a farmers market and fell in love with the sound. I didn't want to outlay a lot of money initially, in case I found the harp too hard to play. So to find your website and the chance to hire was a blessing. It only took 4 months of playing the harp before I ordered my very own harp. And the harp I hired from you sounds as beautiful as the harp I purchased. I still argue with you that your charges are far too cheap. Thank you for all your correspondence regarding the harp and the help you have offered freely. To anyone interested in hiring a harp; I recommend it and also at least one lesson with Robyn to get you started. Thanks again Robyn and I will keep in touch. To me the harp is like water, peaceful and relaxing. After deciding that I'd like to learn the harp, I thought finding a teacher and instrument to learn on would be a challenge. But after discovering Robyn's website, I had hired a harp and had a lesson all within the week. The hiring process was exceptionally smooth and easy. At lessons, Robyn is patient and encouraging; she's very perceptive and sensitive to finding a pace that suits you best. Most importantly, she communicates exceptionally well which is so helpful when learning a completely new instrument. I thoroughly enjoyed and am still very much enjoying my journey with the harp. The hire experience was excellent. It was everything I needed. Thanks again for been able to help me and allow me to play for my family. While thrilled to land a contract position in New Zealand, I was concerned that I wouldn't be able to keep up my harp playing while abroad. Thankfully I found Robyn. She was very helpful in matching me with an instrument that would accommodate my repertoire. The harp delivery was so efficient that the instrument arrived the same day I did, so I didn't miss a single day of practice. Thanks for everything, Robyn! I was so grateful I could rent a harp from you when I knew I was going to be in New Zealand for two months. I take lessons in Canada & wanted very much to continue practising while here. You were a godsend. I enjoyed playing the harp you had for me while I was in New Zealand and I feel I was able to keep up the skills I had developed & then some. Thank you so much for making it available. Perhaps when I return I will do this again. Just to say a big thank you for the hire of the harp. Interestingly, my husband never really took to playing it much, but my 23 year old son, a violinist and electric guitar player, never put it down and managed to enchant us with some beautiful Irish tunes! Many thanks again! It was very helpful that Robyn explained and showed me how to use the harp. I have always enjoyed hearing 'live music' and recently had an opportunity to hear some beautiful music being played on a celtic harp. The enchanting, gentle notes were quite captivating. I decided that I needed to check out the 'celtic harp scenario' in New Zealand. 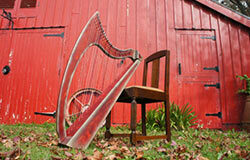 I went online and came across Robyn's site and ended up hiring one of her celtic harps. I was thrilled that a harp was available within a very short period of time and Robyn was most encouraging and supportive of my very amateur ability - setting me up with a suitable instrument and offering some sound 'first' steps for playing the harp. I have thoroughly enjoyed playing and have had such positive feedback from family and friends! Robyn's harp hire service enabled me to grow in my appreciation and commitment to harp playing and I now look forward to buying my own harp. It's been easy and wonderful hiring the harp from Robyn. It definitely helped my dream of learning to play the harp come true. It's great that Robyn has different sizes of harps for hire. She showed me how to tune and look after the harp well. I simply loved the mellow tone of the harp I hired. I also enjoyed the harp lessons with Robyn and appreciated her friendly, patient and encouraging way of teaching. Thank you Robyn. The harp is a beautiful instrument and had a lovely sound right from the first minute I started to play. I have enjoyed learning to play the different songs from the 'Teach yourself' book which came with the harp, it has been a marvellous experience. I was amazed at the condition and fantastic quality of the harp that I hired from Robyn, I would like to thank Robyn for hiring me one of her harps and giving me the chance to learn such a gorgeous instrument. Thank you. During a seven week clinical placement in Auckland I hired a 22 string harp from Robyn to use as a therapeutic tool in brain injury rehabilitation. I was unable to bring up my much larger harp, so was thrilled to find someone as accessible and knowledgeable as Robyn to hire from. The harp was a fantastic size for easy transportation; the sound was lovely and it was easy to tune. I loved that it was painted blue and so did my clients. If you're ever in need of a harp, whether it was for a short time (like me) or a longer amount of time, I strongly recommend Robyn! Thank you, Lauren. I am very thankful to have the chance to learn harp and it is great that Robyn provides the harp renting service. The service is great, as I am able to decide when I want to rent it and when to return it. And Robyn is such a kind and fast responsive person, one time, a string broke and after one email to Robyn, the new string was posted the next day - really great! I just wanted to say a big thank you for the hiring of one of your lovely harps. The teach yourself book is fabulous. The harp has a lovely sound and is very easy to carry around. Its also great to be given a harp tuner as part of the teach yourself package. I look forward to learning more about harpistry with you in the future. I loved hiring a harp for 6 months - it was easy to learn when you apply yourself! The harp was beautiful and simple to tune. Thanks Robyn. The harp is such a lovely instrument! Glad I had a go, even though I'm slack at practicing. I thoroughly recommend hiring one, especially for those of you who don't have a lot of spare time, I did 15 - 30 mins of practice before going to work in the morning and it was a beautiful way to start the day. The whole hire package - some informal technique advice when I picked up the harp, a beginners book and the tuning equipment, is really good value. Simple hire terms, nothing complicated and Robyn is only a phone call away and always happy to help. Being able to rent a harp from Robyn fulfilled a long-held desire of mine to learn to play the harp. This provided me with an affordable opportunity to learn, with the book provided, at my own pace. I attended a couple of harp circles with Robyn and some of her other pupils and this, apart from being very enjoyable, spurred me on. I also had a few lessons and found Robyn a patient and encouraging teacher. All in all I would unreservedly recommend Robyn's harp rental scheme to anyone who wants to give it a go! I will always be grateful to Robyn for making a harp available to me so that I was able to take lessons. Being an older pupil and not knowing anything about the world of harpists it was wonderful to discover Robyn and the harps she hires out. I hired a beautiful sounding small harp for beginners until I was able to buy my own. Robyn was also very helpful in lending me a music book for beginners and providing me with a lot of useful information regarding harps. Thank you Robyn for helping me to get started on the musical enjoyment I am now experiencing. I was overjoyed at the quality of the harp I hired from Robyn! The sound was beautiful and , as I was traveling, the size of the instrument was just perfect for my lifestyle! I would highly recommend this harp to anyone, whether a beginning student or a more advanced player. What a wonderful opportunity to use such a beautiful instrument! Hiring the harp from Robyn was so easy, a monthly direct debit gave me the freedom to learn and practise the harp at home without spending a fortune on owning one. It's a lovely little harp and I found it really easy to learn on and having carried it around Auckland to lessons, it's easy to travel with too. Hiring a harp for a couple of months recently was a really worthwhile experience. It was great to have the opportunity to try out playing this instrument and I really appreciate the access Robyn’s harp hire provides for people like me who are keen to have a go. With a lesson to get me started initially I then carried on with the Teach Yourself book which was provided. The book was very user friendly, I found it easy to follow and there was a nice selection of tunes to play. I got a lot of enjoyment out of playing the harp even for the short time I had it so thank you Robyn for this excellent service. Hiring a harp from Robyn has been a great experience. It was a lovely 26 string instrument, that came with a book of music - from beginner level to expert, tuning key and tuner. Robyn has given me short lessons on the basics of tuning, holding the harp, and playing it, and playing chords. 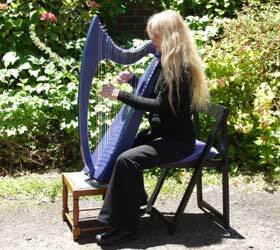 She has kept in touch, offering support and information, and advising of harp gatherings. Robyn's ongoing support and encouragement has resulted in me buying my own kitset harp, knowing I can go back to her for more lessons as I need them. I had wanted to try the harp for years but was always put off by the cost of buying a harp. Then when I finally checked the internet I found Robyn had harps for hire at a reasonable cost and she was only 20 minutes away. She agreed to show me the ropes since I was not intending to have lessons and continued to show an interest in my progress, even going to the extent of sending me a book of Medieval harp music which she thought I might find interesting. All in all, a very pleasant experience - and now she's teaching my daughter. The harp is such a magical instrument. To me it's sound transcends the physical world and enters a realm that speaks to our hearts of beauty, peace, and tranquillity. Robyn gives such a gift through allowing people to hire these beautiful instruments and sharing her knowledge so willingly with others. I look forward to a time when I can dedicate myself to the proper learning of this instrument. The harp I hired had a lovely tone and was a good size. The extras - book, bag, tuner, tuning wrench - were likewise excellent and altogether provided the perfect starting kit. The harp is a wonderful instrument to play - really therapeutic, and it always sounds nice, unlike beginning on the violin. I very much enjoyed the time I had with the harp and am now waiting until I can afford one of my own. The harp provided was in excellent condition with a beautiful tone and just the right number of strings and levers to learn on. Easy to tune; no issues. The beginners book provided was easy to read from and had a lot of interesting music, gradually grading up to more sophisticated numbers. Robyn has always been pleasant, friendly and gently encouraging. I'm deeply thankful I had the opportunity to hire a harp from her, and look forward to commissioning one. First of all, thank you so much for helping Martin to give me the most innovative Christmas gift I have ever had from him! I loved your CD and have really enjoyed experimenting with the lovely little harp he hired from you. I was able to follow the first part of the book, and once I had found middle C was able to start picking out various tunes. However, as I have played piano by ear for years now I have completely forgotten the theory part of music and therefore would have to start learning it all over again to be able to do justice to having my own harp. I'm afraid this would really be in the too-hard basket for me now, both mentally and also from finding the time to do so. Having a harp of my own for two months has just been lovely and I now find I can appreciate the playing of it more when I see various harpists playing in films or DVD's - I can understand to a greater extent what they are doing. So it really has been worthwhile, even if I don't follow up with lessons. Thank you so much again for what was a wonderful surprise and many hours happily playing around with it. The beautiful harp I hired from Robyn I found to be a relaxing way to ‘have a go’ - having the time to learn before making further commitment was a great recommendation for me. I found the sound and presence of the harp a joy on our home. my wife played our children to sleep often. Robyn has a care and sensitivity for the harp and for her students that makes you want to continue to develop your skills. Being able to hire one of her harps made it possible for me to fulfill a childhood dream of playing the harp. The harps are beautiful to play with great resonance and even a beginner can make beautiful music with them. Thanks Robyn for this wonderful opportunity. Hamish started playing his harp almost 2 years ago. He got a beautifully painted harp in an excellent condition. Being only 8 we were not so sure whether he will continue with this instrument for long so we've decided to hire this magic instrument from Robyn. The sound and ease of use made him fall in love with this instrument, and we never have to ask him to practice once. We would highly recommend to anyone who wants to experience the sound of a harp to give it a go. You may surprise yourself. The size is very portable and the amount of strings, perfect for a beginner. Thank you so much, it has been great practicing on the harp and I wish I could afford to rent and save for my own one at the same time. All in good time. Once I have my own I will probably come and have some lessons, esp as I will have forgotten all I have learnt so far by the time I have my own. This is the story of one lady who hired a harp. . .
To me, playing harp in a small intimate setting is very fulfilling. I believe the sound of the harp can be very healing – it has this way of ministering to the soul and spirit. This is especially true for people who are perhaps more vulnerable and needy. The amazing fact is, that in my modest musical offerings on harp, my listeners aren’t the only ones who are touched – I am blessed in the process as well. My harp playing takes me into rest homes on the Kapiti Coast, to music therapy sessions with children with special needs, to hospital wards and housebound people battling serious illness or those who just need a lift. My husband and I also team up to play at contemplative church services and retreats. I have collected some precious memories in the nearly 3 years that I have been playing harp. Here are a few examples: A particularly challenging autistic girl I work with in a school setting became unbelievably calm upon hearing the harp live for the first time. This angry and even at times violent 8-year-old promptly curled up on her teacher aide’s lap and fell asleep! I was blown away! Her aide knew we were onto something special so if I couldn’t play “live”, reordered harp music was pretty successful in calming her down as well. Seeing the joy on the faces of the elderly when being given the opportunity to have a turn at ‘playing’ my harp is marvellous. Something magical happens when they gently gliss up and down the strings. Other special moments happen when dementia patients who don’t often speak, sing every word of a well-known hymn or song from yesteryear! Recently I played for my Dad in Wellington hospital. He had had major surgery and harp music was a welcome distraction from the pain and worry. His roommates on the ward seemed equally pleasurably diverted. As it happened a family friend was admitted to the same hospital a floor down so the harp was packed up and reassembled a few minutes later where it seemed most of that ward’s patients and staff enjoyed a brief live musical interlude! It would be fair to say that I have myself come ‘full circle’ on my musical journey, rekindling the first love of playing music for fun and for others. I remember doing this as a primary school aged recorder player when I got a buzz out of playing in small musical ventures. From the age of 19, I was a professional symphony orchestra oboist in NZ and then in Sydney for 20 years. It would be fair to say that I achieved a lot musically during that time. However, a spinal injury saw my career end overnight ending up with my family moving back to NZ. I was also an avid cross stitcher but when this too became too hard on my neck I thought I’d try something totally new and took up the harp, hiring one from Robyn Sutherland in Auckland. Needless to say, I was soon addicted to this new way of playing music….not only did it sound nice, it had added benefits………...one could talk/sing and play at the same time and one didn’t have to spend hours making reeds! Let me encourage you to share your music with others, no matter how modestly, on this most beautiful of instruments we have the privilege of playing.